Edited by Gordon Van Gelder, winner of the Hugo Award for his editorial work on The Magazine of Fantasy & Science Fiction, this collection includes stories from an impressive list of authors, such as: Stephen King, Robert A. Heinlein, Zenna Henderson, Charles De Lint, and Jane Yolen. Because Volume 1 couldn't possibly cover all of the meaningful contributions in The Magazine of Fantasy & Science Fiction's sixty-five years, Volume 2 gives us twenty-six more stories, both from names we’ve heard of and others we’ve been missing out on for too long. F&SF’s Greatest Hits, Volume 2. An anthology's lead has got to be its organizing principle. As Van Gelder says, “[…] here in the second volume, I’ve tried to assemble a good representation of the magazine’s whole history, from the 'Eureka Years' […] on through the second decade of the twenty-first century.” The stories explore a broad stylistic and thematic terrain. There are so many wonderful stories in here, but the perfect lead/actor combo has got to be Rat, from the same-named cyber-punk thriller by James Patrick Kelly, played by Andy Serkis of Gollum fame. If he can do Gollum, he can do a drug-smuggling hobbit-sized rat running from the dealers he’s double-crossed, seeking sanctuary in a treacherous cyber-punk landscape that makes Mordor look like a quaint spot to open an old country B & B. From cyber-punk ghettoes to secret levels at Grand Central Station that send travelers through time, several of these settings are bound to pique your interest. But, often, and particularly in the older fiction, the stories’ settings contribute to more obvious societal critique than might be in vogue these days. Meaning, if you want to live here you’re going to have to deal with settings that are hotbeds for colonialism, repression, poverty, violence, and existential crisis—then again, what setting isn’t? 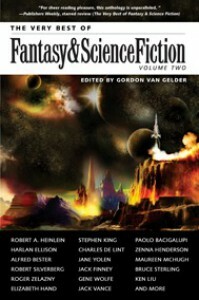 The Very Best of Fantasy & Science Fiction, Volume 2 is a great addition to any reader’s library because it chronicles the genres’ changes over time. All of the stories are enjoyable, despite older Sci-Fi’s occasional tendency to come off precisely as Dirda claims it does not, which is “out of date or corny”; I agree wholeheartedly with him that even when out of date, these stories are not “irrelevant”. In fact, I’d just as quickly recommend this anthology for use as a textbook in a Science-Fiction writing or reading class as I would for a pleasant poolside reader, as we wean ourselves off summer. What’s more, the anthology’s final story, Paper Menagerie, is the best choice for the end of an anthology representing the best of two genres that deserve to be read as Literature. Liu’s story, published in 2011, was the first story ever to win the Hugo, Nebula, and the World Fantasy awards, and it is a work of art. Save it for the end, and savor it. In it, a woman breathes life into origami pets she makes for her son, and he finally learns how to appreciate them far too late. This was practical magic in the life of the village. We made paper birds to chase grasshoppers away from the fields, and paper tigers to keep away the mice. Fiction, in the life of our global village, is our practical magic. It chases away the existential grasshoppers and mice. There is a lesson here in Liu's story and in the anthology itself. 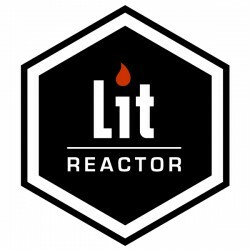 That lesson being, we should never take for granted the breath of life writers have given to their stories, whether back in the past, here in the present, or far, far into the future. The Very Best Fantasy & Science Fiction, Volume 2 is one book to help us keep that in mind.